Galbi (갈비), galbi-gui (갈비구이), or grilled ribs is a type of gui (grilled dish) in Korean cuisine. "Galbi" is the Korean word for "rib," and the dish is usually made with beef short ribs. When pork spareribs or another meat is used instead, the dish is named accordingly. Galbi is served raw, then cooked on tabletop grills usually by the diners themselves. The dish may be marinated in a sweet and savory sauce usually containing soy sauce, garlic, and sugar. Both non-marinated and marinated galbi are often featured in Korean barbecue. An alternative cut, "LA galbi", features cut bones peeking out along the long edge. The method was developed by Korean immigrants in Los Angeles to accommodate the thinner rib-eye cut preferred by American butchers. The variation, which enables the marinade to penetrate the meat faster, has since made its way back to South Korea. Non-marinated galbi is called saeng-galbi (생갈비; "fresh ribs"); marinated galbi is referred to as yangnyeom-galbi (양념갈비; "seasoned ribs"). Pork galbi is usually served marinated, but non-marinated dwaeji-saeng-galbi (돼지생갈비; "fresh pork ribs") made of Jeju Black pig is popular in Jeju Island. As pork ribs are smaller, marinated dwaeji-galbi often consists of pork ribs mixed with shoulder meats. Softer cuts of beef, such as from a cow or heifer, are preferred when grilling galbi. Properly grilled, the dish is a glossy, dark-reddish brown with a smoky, sweet taste. The meat should easily fall from the bones. 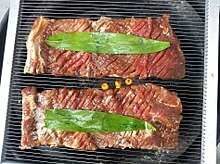 The marinade for so-galbi-gui (소갈비구이; "grilled beef ribs") typically includes soy sauce, sugar, minced garlic and scallions, ginger juice, ground black pepper, toasted and ground sesame, and sesame oil. The beef is usually scored on the surface prior to marinating, and the juice from Korean pears is brushed on before grilling. For dwaeji-galbi-gui (돼지갈비구이; "grilled pork ribs"), the marinade can be either ganjang (soy sauce)-based or gochujang (chili paste)-based: the former being similar to beef galbi marinade and the latter being spicy. Cheongju (rice wine) is usually used in both types of marinade to remove any undesired porky smell. If used, pork shoulder meat is carved into thicker slices of around 2.5 centimetres (0.98 in) in width. Deeper cuts are made when scoring the surface to allow the marinade to penetrate the meat. A dish called sườn nướng (lit. grilled ribs) in Vietnamese cuisine is similar to dwaeji-galbi (pork galbi). ^ a b c (in Korean) "주요 한식명(200개) 로마자 표기 및 번역(영, 중, 일) 표준안" [Standardized Romanizations and Translations (English, Chinese, and Japanese) of (200) Major Korean Dishes] (PDF). National Institute of Korean Language. 2014-07-30. Retrieved 2017-02-26. Lay summary. ^ Tanis, David (2013-02-15). "Korean Short Ribs - City Kitchen". The New York Times. Retrieved 2017-02-26. ^ Viggiano, Brooke (2016-11-14). "Dish of the Week: Galbi (Korean-Style Short Ribs)". Houston Press. Retrieved 2017-02-26. ^ Walters, April V. (2014). "25. Galbi". The Foodspotting Field Guide. San Francisco, CA: Chronicle Books. ISBN 9781452119878. ^ Michael, Dikeman; Devine, Carrick, eds. (2014). Encyclopedia of Meat Sciences (2 ed.). London: Academic Press. p. 547. ISBN 9780123847317. ^ 16 March 2017. "제주를 제대로 즐기는 법, 중문에서 흑돼지 맛집 따라 인심 느낄 수 있어". Sport Chosun (in Korean). Retrieved 18 May 2017. ^ a b c 월간외식경영 (9 February 2017). "콘셉트에 따라 객단가 올릴 수 있는 아이템, 양념돼지갈비". Maeil Business Newspaper (in Korean). Retrieved 18 May 2017. ^ a b c d (in Korean) 정, 순자. "갈비구이" [galbi-gui]. Encyclopedia of Korean Culture. Retrieved 8 March 2017. ^ a b (in Korean) "소갈비구이" [so-galbi-gui]. Doopedia. Doosan Corporation. Retrieved 8 March 2017. ^ (in Korean) "돼지갈비구이" [dwaeji-galbi-gui]. Doopedia. Doosan Corporation. Retrieved 8 March 2017. ^ Ro, Hyo-sun (4 April 2014). "Dwaeji galbi (pork ribs)". The Korea Herald. Retrieved 18 May 2017. ^ a b Yoon, Howard (August 10, 2005). "A Hard-to-Kick Habit: Korean Barbecue Short Ribs". NPR. Retrieved 2008-04-20.